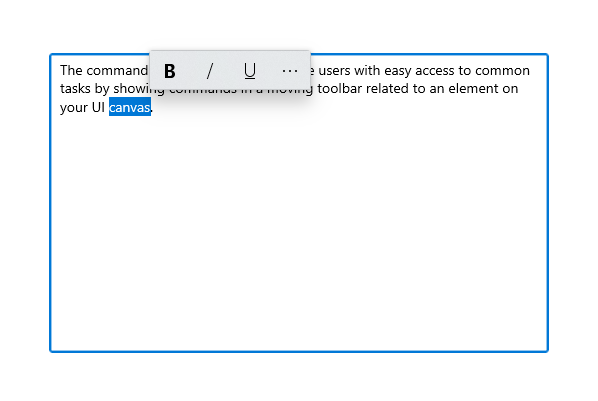 The command bar flyout lets you provide users with easy access to common tasks by showing commands in a floating toolbar related to an element on your UI canvas. CommandBarFlyout requires Windows 10, version 1809 (SDK 17763) or later, or the Windows UI Library. Like CommandBar, CommandBarFlyout has PrimaryCommands and SecondaryCommands properties you can use to add commands. You can place commands in either collection, or both. When and how the primary and secondary commands are displayed depends on the display mode. The command bar flyout has two display modes: collapsed and expanded. In the collapsed mode, only the primary commands are shown. If your command bar flyout has both primary and secondary commands, a "see more" button, which is represented by an ellipsis [•••], is displayed. This lets the user get access to the secondary commands by transitioning to expanded mode. Use the CommandBarFlyout control to show a collection of commands to the user, such as buttons and menu items, in the context of an element on the app canvas. The TextCommandBarFlyout displays text commands in TextBox, TextBlock, RichEditBox, RichTextBlock, and PasswordBox controls. The commands are automatically configured appropriately to the current text selection. Use a CommandBarFlyout to replace the default text commands on text controls. To show contextual commands on list items follow the guidance in Contextual commanding for collections and lists. To show commands in a context menu, you can use CommandBarFlyout or MenuFlyout. We recommend CommandBarFlyout because it provides more functionality than MenuFlyout. You can use CommandBarFlyout with only secondary commands to get the behavior and look of a MenuFlyout, or use the full command bar flyout with both primary and secondary commands. For related info, see Flyouts, Menus and context menus, and Command bars. 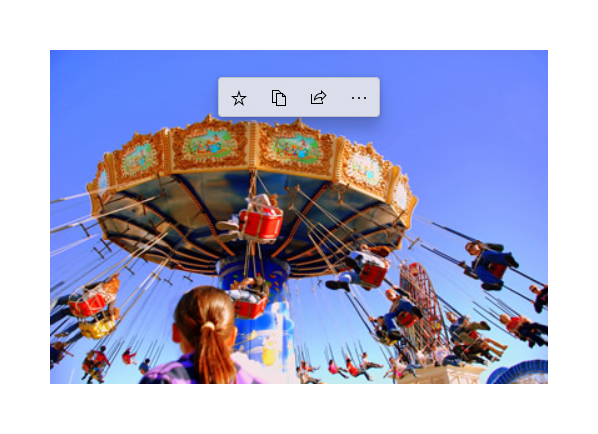 If you have the XAML Controls Gallery app installed, click here to open the app and see the CommandBarFlyout in action. There are typically two ways to invoke a flyout or menu that's associated with an element on your UI canvas: proactive invocation and reactive invocation. In proactive invocation, commands appear automatically when the user interacts with the item that the commands are associated with. For example, text formatting commands might pop up when the user selects text in a text box. In this case, the command bar flyout does not take focus. Instead, it presents relevant commands close to the item the user is interacting with. If the user doesn't interact with the commands, they are dismissed. In reactive invocation, commands are shown in response to an explicit user action to request the commands; for example, a right-click. This corresponds to the traditional concept of a context menu. You can use the CommandBarFlyout in either way, or even a mixture of the two. This example shows how to create a command bar flyout and use it both proactively and reactively. When the image is tapped, the flyout is shown in its collapsed mode. 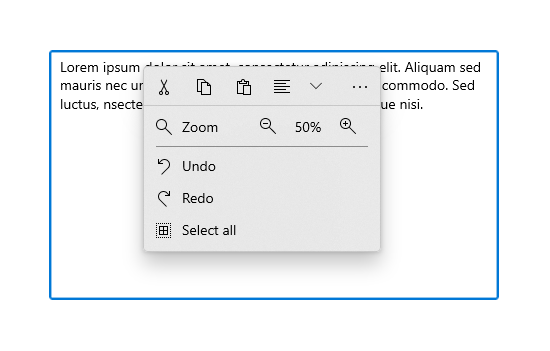 When shown as a context menu, the flyout is shown in its expanded mode. In either case, the user can expand or collapse the flyout after it's opened. // Position shows the flyout next to the pointer. // "Transient" ShowMode makes the flyout open in its collapsed state. When you show contextual commands proactively, only the primary commands should be shown by default (the command bar flyout should be collapsed). Place the most important commands in the primary commands collection, and additional commands that would traditionally go in a context menu into the secondary commands collection. To proactively show commands, you typically handle the Click or Tapped event to show the command bar flyout. Set the flyout's ShowMode to Transient or TransientWithDismissOnPointerMoveAway to open the flyout in its collapsed mode without taking focus. 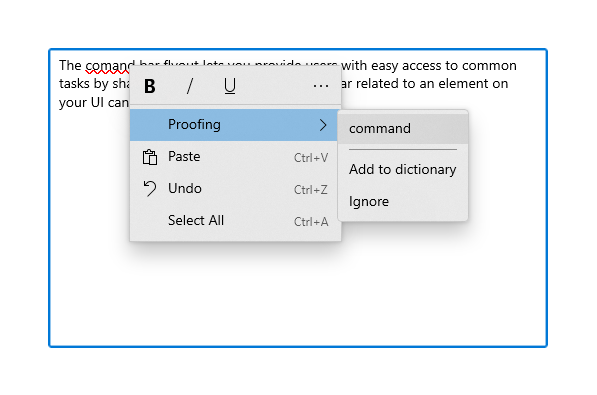 Starting in the Windows 10 Insider Preview, text controls have a SelectionFlyout property. When you assign a flyout to this property, it is automatically shown when text is selected. 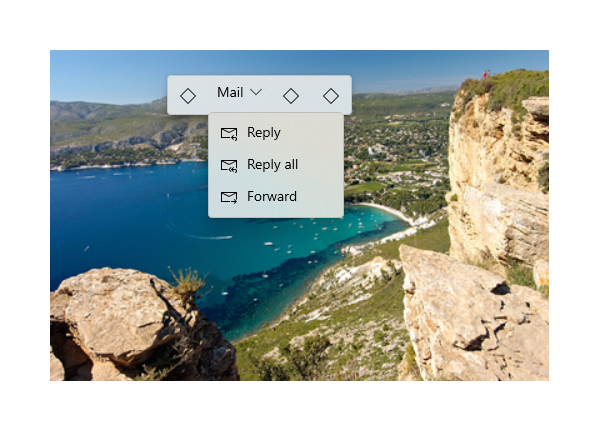 When you show contextual commands reactively, as a context menu, the secondary commands are shown by default (the command bar flyout should be expanded). In this case, the command bar flyout might have both primary and secondary commands, or secondary commands only. To show commands in a context menu, you typically assign the flyout to the ContextFlyout property of a UI element. This way, opening the flyout is handled by the element, and you don't need to do anything more. If you handle showing the flyout yourself (for example, on a RightTapped event), set the flyout's ShowMode to Standard to open the flyout in its expanded mode and give it focus. For more info about options when showing a flyout and how to control placement of the flyout, see Flyouts. The CommandBarFlyout control has 2 properties you can use to add commands and content: PrimaryCommands and SecondaryCommands. By default, command bar items are added to the PrimaryCommands collection. These commands are shown in the command bar and are visible in both the collapsed and expanded modes. Unlike CommandBar, primary commands do not automatically overflow to the secondary commands and might be truncated. You can also add commands to the SecondaryCommands collection. Secondary commands are shown in the menu portion of the control and are visible only in the expanded mode. You can populate the PrimaryCommands and SecondaryCommands directly with AppBarButton, AppBarToggleButton, and AppBarSeparator controls. The app bar button controls are characterized by an icon and text label. These controls are optimized for use in a command bar, and their appearance changes depending on whether the control is shown in the command bar or the overflow menu. App bar buttons used as primary commands are shown in the command bar with only their icon; the text label is not shown. We recommend that you use a tooltip to show a text description of the command, as shown here. App bar buttons used as secondary commands are shown in the menu, with both the label and icon visible. You can add other controls to a command bar flyout by wrapping them in an AppBarElementContainer. This lets you add controls like DropDownButton or SplitButton, or add containers like StackPanel to create more complex UI. In order to be added to the primary or secondary command collections of a command bar flyout, an element must implement the ICommandBarElement interface. AppBarElementContainer is a wrapper that implements this interface so you can add an element to a command bar even if it doesn't implement the interface itself. Here, an AppBarElementContainer is used to add extra elements to a command bar flyout. A SplitButton is added to the primary commands to allow selection of colors. A StackPanel is added to the secondary commands to allow a more complex layout for zoom controls. Override the default brushes with lightweight styling to make the element's background and border match the app bar buttons. Adjust the size and position of the element. Wrap icons in a Viewbox with a Width and Height of 16px. This example shows only the command bar flyout UI, it does not implement any of the commands that are shown. For more info about implementing the commands, see Buttons and Command design basics. You can use a CommandBarFlyout with only secondary commands as a context menu, in place of a MenuFlyout. You can also use a CommandBarFlyout with a DropDownButton to create a standard menu. The TextCommandBarFlyout is a specialized command bar flyout that contains commands for editing text. Each text control shows the TextCommandBarFlyout automatically as a context menu (right-click), or when text is selected. The text command bar flyout adapts to the text selection to only show relevant commands. This table shows the commands that are included in a TextCommandBarFlyout, and when they are shown. Bold when the text control is not read-only (RichEditBox only). Italic when the text control is not read-only (RichEditBox only). Underline when the text control is not read-only (RichEditBox only). Proofing when IsSpellCheckEnabled is true and misspelled text is selected. Cut when the text control is not read-only and text is selected. Copy when text is selected. Paste when the text control is not read-only and the clipboard has content. Undo when there is an action that can be undone. Select all when text can be selected. TextCommandBarFlyout can't be customized, and is managed automatically by each text control. However, you can replace the default TextCommandBarFlyout with custom commands. To replace the default TextCommandBarFlyout that's shown on text selection, you can create a custom CommandBarFlyout (or other flyout type) and assign it to the SelectionFlyout property. If you set SelectionFlyout to null, no commands are shown on selection. To replace the default TextCommandBarFlyout that's shown as the context menu, assign a custom CommandBarFlyout (or other flyout type) to the ContextFlyout property on a text control. If you set ContextFlyout to null, the menu flyout shown in previous versions of the text control is shown instead of the TextCommandBarFlyout.